Sainz has his work cut out for him. He's taking over Palmer's seat and moving to a brand new team and car at the end of the season. Hulkenberg has had a whole year to get acclimatized to his new team so he'll probably have an advantage. Next year there will be no excuses for Sainz though. He will have 4 races and a whole winter break under his belt to get used to his new team and car. I'd be surprised if Hulk doesn't win out for the remainder of the season. Sainz with the edge in 2018. Fully expect Sainz to expose Hulkenberg. Hulk for this season. Similar performance next. Are you asking who will come out on top in 2018 or in the next 4 races????? Also maybe add the option to close to call. Sainz for me. But it should be interesting to see what the gap looks like after a representative sample of races; Hulk has had second-hand comparisons to Button before, but now he'll have a second-hand comparison to Max, an unquestioned top driver. It doesn't seem likely that Hulk will ever actually have a top driver for a teammate, so that might be as close as we get. It's early days, and it's only practice but he is already quicker by the looks of it. I fully expect Sainz to have the edge over Hulk. I'd put Hulk a quarter of the way from Sainz to Kvyat so we should see the remaining races be drawn 2-2 or come out in Carlito's favour. I think that is most likely too. Sainz has made rather a lot of mistakes over the past year and some very costly ones. He may get better and improve next year. But I think it will take him the remaining of this season to get more familiar with the car. But it isn't like Hulkenberg has been in this car long either. So next year should be a pretty fair comparison against them if they have roughly equal luck. Yup but I think that will take place next year. In 2017, Sainz will have his work cut out for him to adapt to the new team and car. I'd be surprised if he gets the better of Hulk straight away. I don't have Verstappen beating Sainz in qualifying, I have it about as equal as you can get it, Verstappen's greater strength seemed to be in the race. Where does the chart say it's about qualifying? True, I've just noticed this is F1 metrics who have Rosberg as a better driver than Senna I believe? Yeah, I'm hardly the biggest believer in their model either, I was just pointing out that I think the chart is supposed to incorporate race pace as well. Although I have to say, Bottas is making Rosberg look a lot better in retrospect. I guess if that is the case, you wound't have Kvyat far off Verstappen in qualifying either? Sainz and Kvyat have been pretty evenly matched in qualifying on the whole this year. I am still trying to figure out if you genuinely like Kvyat or if you are just a Verstappen fan. 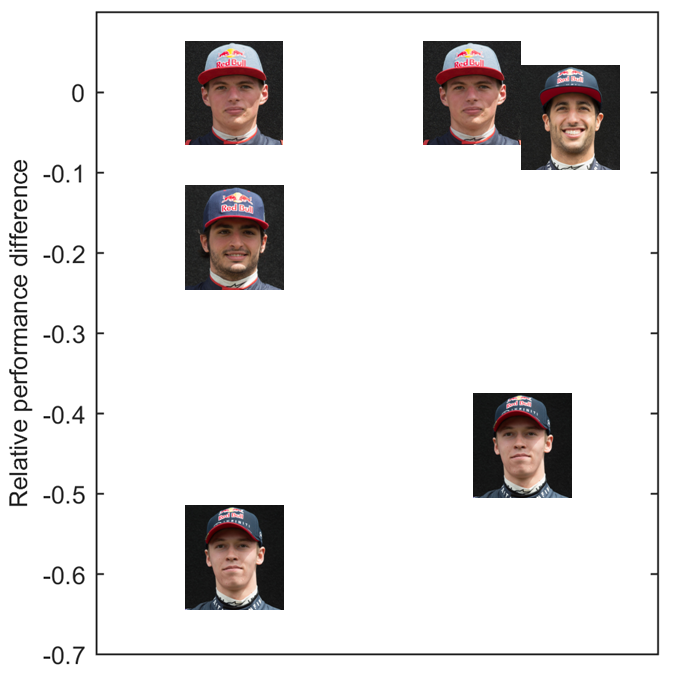 You like to see only Sainz mistakes and overrate the prowesses of Kvyat and Verstappen. I am sorry but Sainz will deliver despite what most of the guys here think. Just give him Ricciardo's car and Verstappen will have his hands full in qualifying. I think either Kvyat has to be decent in qualifying or it most certainly is not Sainz's strong point. Kvyat was much worse than Ricciardo in qualifying and mid way through this season, with all their qualifying times averaged out, Kvyat was marginally ahead of Sainz. And there have been one or 2 qualifying sessions since where Kvyat has beaten Sainz again. They have been very close in this area when averaged out. And Ricciardo who dominated Kvyat in qualifying is now not looking as good as Verstappen on the whole in qualifying. I think Verstappen is the best out of these 4 drivers in qualifying, then Ricciardo. Then a fair way behind in my view, Sainz and Kvyat and they to me are on a similar level, just not on race pace. But I'll be honest, both Sainz and Kvyat have had lots of crashes this year and this is one of the reasons why I think Sainz isn't as good as many suggest. He's caused more retirements than any other driver this year and some of his incidents have looked very stupid indeed. His pace when he's good is indeed great, but I haven't see that significantly more this year than him make big mistakes if I'm honest. I have paid attention and Kvyat has made a lot of mistakes, but he's only been responsible for his own retirement once. Sainz has cost himself his own race 3 times. I rate Kvyat a bit higher than many because I believe his pace is decent, he just makes a lot of mistakes. I'm no far of Verstappen at all and I thought I had actually pointed out more negatives about hive that trying to point out the prowesses about him. I just think he has improved a lot this year as he is often looking better than Ricciardo where as I don't think Sainz has improved much since last year as he's made a lot more mistakes than his previous 2 seasons too. I expect it to be close over the last races this year, but Sainz to be the stronger driver in 2018. I'd definitely rate Sainz over Hulk, and I say that as a Hulkenberg fan. It is a Good thing what matters the most is how good you do on a track, not fans ratings. Let Verstappen start 12th every week in his 3rd year in Toro Rosso and witness how many times he will NOT crash. You say Verstappen has made progress but not Sainz. Put them in the same car. I will be curious to see Verstappen outqualify Sainz 11 - 2 (it is not going to happen). Are you even sure Ricciardo could beat Sainz? I would not bet my house on it. It is amazing how much harder Verstappen had it against Sainz. This will be an excellent battle. i think the hulk will win out, barely. If today's race is to go by, Sainz will dominate Hulk. Sainz is a points hoover. He's not going to languish for years without a podium when given the car. Great race by Sainz - only the Merc engine saved Ocon today. Does anyone know what happened to Hulkenberg today? I'm really excited about this battle for 2018! Is it? Which one Perez uses then? Ocon had more speed in the car then Perez. Ocon did get stuck behind Massa which is why Sainz closed in on both FI drivers. But Ocon maintained a cool composure & didn't give in. Considering Ocon was ill on Saturday (don't know about Sunday) with Migraine & stomach ache, he did pretty well. ...Does anyone know what happened to Hulkenberg today? Did a single run in Q1, got though. Didn't run in Q2 at all due to impending grid penalties. Started 18th due to said penalties and retired on lap 3 due to oil pressure. ...So this weekend wasn't exactly representative of his pace vs Sainz. In a way it is. I'm 100% sure if Hulk was behind both of the FI cars, he would've been there. His race craft most of the times is sombre. I'd put Sainz, Ocon & Perez in 1 bracket & Hulk in the one below. Yes he will, if Hulkenberg always starts from the back and retires with a mechanical failure. Why not 110% while you're at it? I think that Sainz put in a drive that matched about the best you would expect from Hulk. If Hulk is worried he should be. And I thought Hulk would probably edge Sainz out. Not saying that now can't happen but Sainz did much, much better than I was expecting. I could go 120%! Anyway, time will prove when Sainz gets the measure of Hulk. On a serious note though Sainz put in the kind of performance you’d expect to see from the Hulk, fighting with the Force India’s for the best of the rest slot, so I’m expecting some good battles between them this year, I think they’ll be pretty close together on track.